Love the smell of these! So did my fiance (now husband)! This was my first time trying a solid cologne and to tell you the truth, I was a bit Leary at first. I finally purchased the 3 pack and I’m sooo glad I did. I’m still using the musician scent and I haven’t run out ! I’ve been getting so many compliments on how good I “ smell” that I’m going to have to start switching it up and start using the other two. ( the adventurer and the gentleman). A huge thanks to the Walton Farm workers and everyone else there. You have a return customer here! If you haven’t tried these yet, Why? It’s a no brainer as far as I’m concerned. Enjoy the scents and the compliments everyone. Everyone "SHOULD" Have This on Stand By!! Ya Gotta Try!! 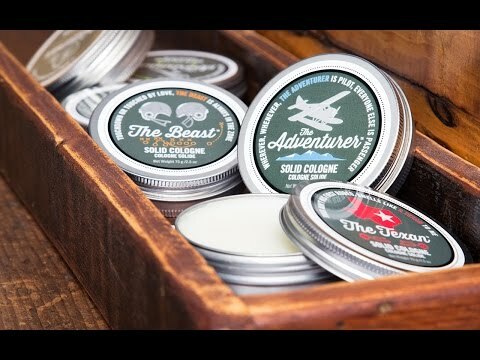 My husband likes the ease of the solid cologne AND we both love the scent! Well done! very happy with this product, but would like to know the best way a apply it. I like it better than the sprays. However it is a bit difficult to apply without rubbing the surface rather vigorously so it softens. Has the maker thought about a stick form similar to a deodorant? I will purchase another in the future. Got the sportsman. It smells true to the description. Seems to be subtle but lasts a while. I dig it. I love this stuff! I was looking for a fragrance that is crisp, clean and manly, not flowery and "perfumie". The Texan fit the bill perfectly. While the scent is pleasant, it is also unique; it won't be mistaken for some cookie-cutter designer scent. I will definitely be returning for more. This is a great idea, and I can't believe it took so long for someone to invent it! I wish you would consider making a female line of your product. I can'wear most florals, or strong feminine perfumes. I have been on a search for a spice based, vanilla, etc. Perfume, and haven't found much. Thank you!